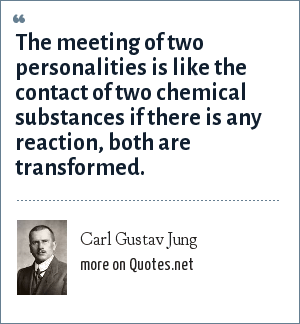 Carl Gustav Jung: The meeting of two personalities is like the contact of two chemical substances if there is any reaction, both are transformed. The meeting of two personalities is like the contact of two chemical substances if there is any reaction, both are transformed. "Carl Gustav Jung Quotes." Quotes.net. STANDS4 LLC, 2019. Web. 24 Apr. 2019. <https://www.quotes.net/quote/14612>.